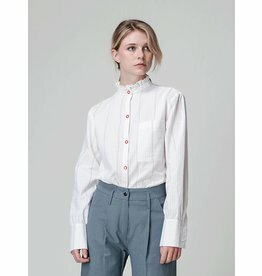 Slate silk shirt with button closure and ruffled collar, Front pocket and long cuffed sleeves, ideal for summer! Relaxed fit. model wears a size 36. White, red and blue striped cotton shirt with button closure and ruffled collar, Front pocket and long cuffed sleeves, ideal for summer! Relaxed fit. model wears a size 36. Short sleeved darkgrey top with slit front neck and ruffled collar and box pleat at the back. Model wears a size 36. Really comfortable pant with tapered leg, shirred, elastic waist, hip pockets and a welt pocket at the back. relaxed fit. Made of 95% lightweight silk 5% ea, which makes it a light comfy pant, perfect pants for summer! Really comfortable pant with tapered leg, shirred, elastic waist, hip pockets and a welt pocket at the back. relaxed fit. 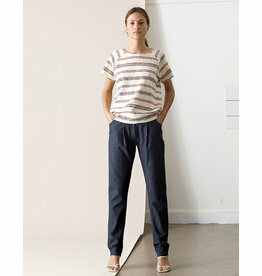 Color: stripe, made of 100% cotton, which makes it a soft comfy pant, perfect pants for summer! Relaxed stripy skirt with side pockets and elastic waist, very comfortable and perfect for summer. The length of the skirt is just over the knee, model wears a size 36. Striped cotton oskosh shirt with a stand up collar, button closure at the front. Short folded sleeves with cuffs and small pleats at the back. The model wears a size 36. 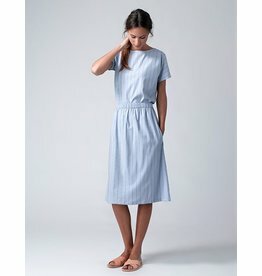 Straight jersey dress made from striped jersey. Drawstring at the waist, straight hemline, sits at the knee. Round necklline, unfinished capsleeves. Relaxed fit, model wears a size 36.